With the amount of time I spend on Pinterest scrolling through other people's picture perfect homes, you'd think I'd be an home decor expert by now, but nope. I actually find it a little overwhelming trying to piece together what looks best where and trying to keep within my 'room theme' without overdoing it. Sometimes it's best to take a step back, and strip away everything and go back to basics. 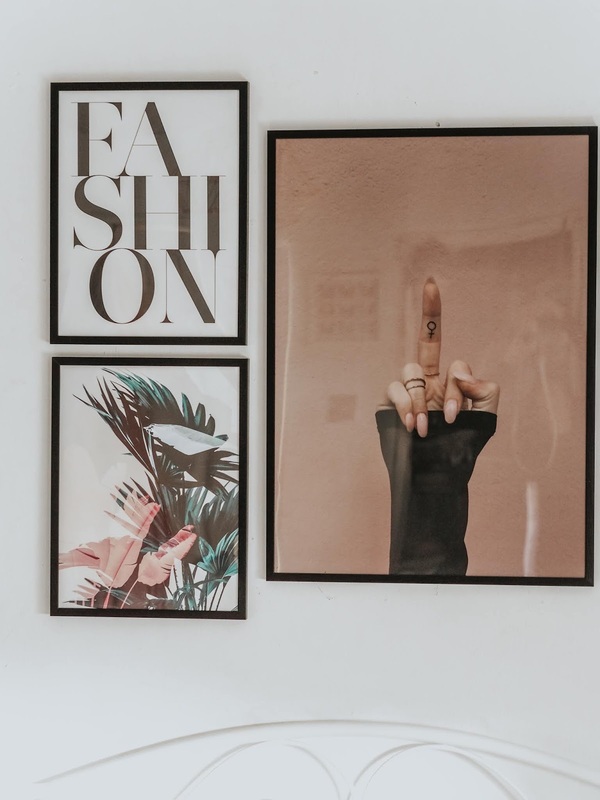 On the likes of Pinterest and various other blogs, you'll find so many fantastic tips for decorating a room and making it look unique, and turning every inch of your home into something new and exciting. But if like me, that's a little too overwhelming for me. 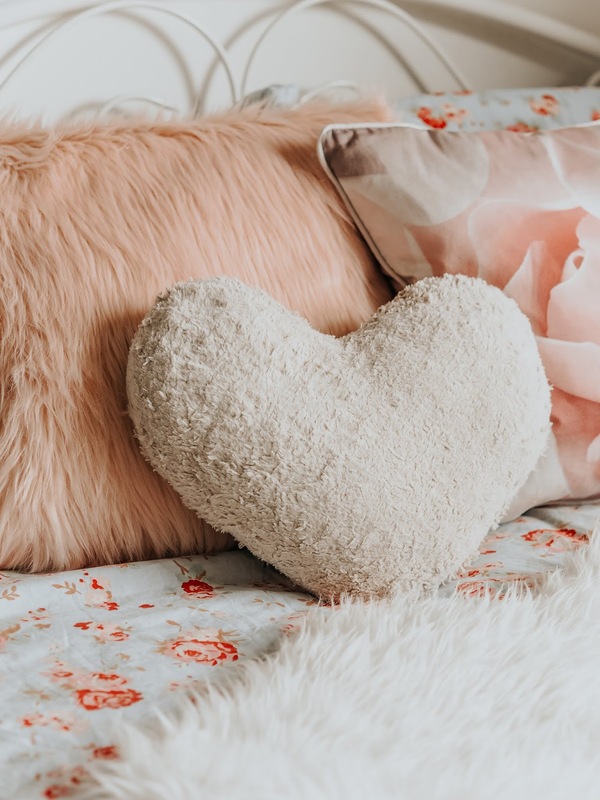 So, here's four quick, easy and affordable ways to spruce up your living space.. AKA the home decor guide for lazy people like me. 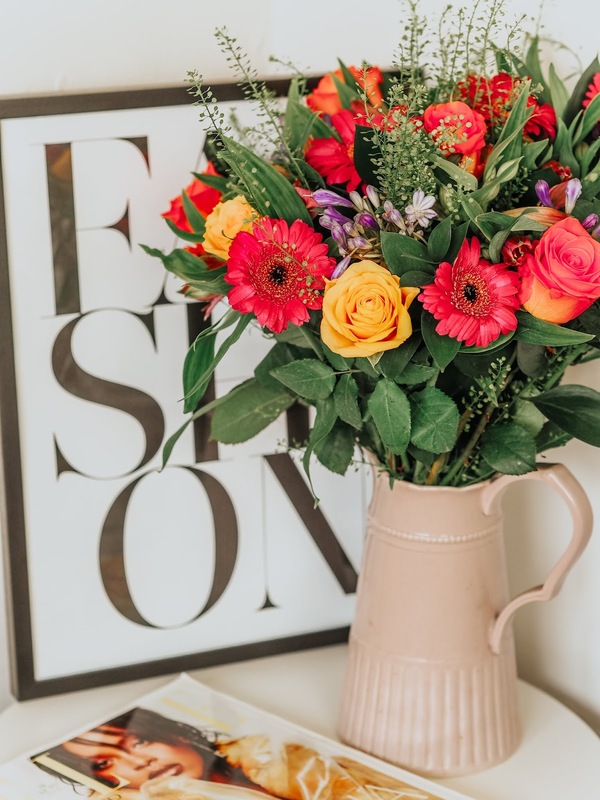 This year I've been trying to get into the habit of gifting people bouquets of flowers as they look so gorgeous in your home, and yet we rarely buy them for ourselves! 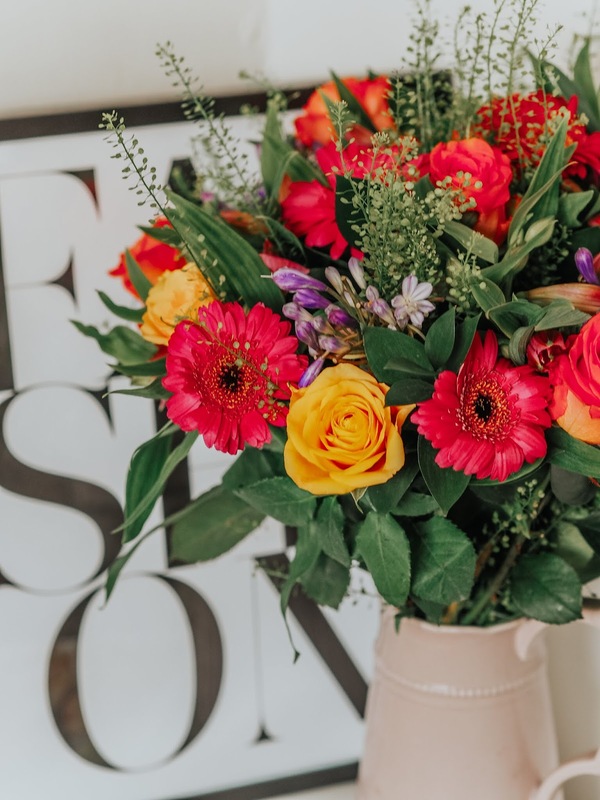 Since my bedroom is very monochrome with small accents of colour, I decided to add a very colourful bouquet to just brighten up the room a bit more! This particular bouquet is the Citrus Coulis Bouquet from Appleyard London. 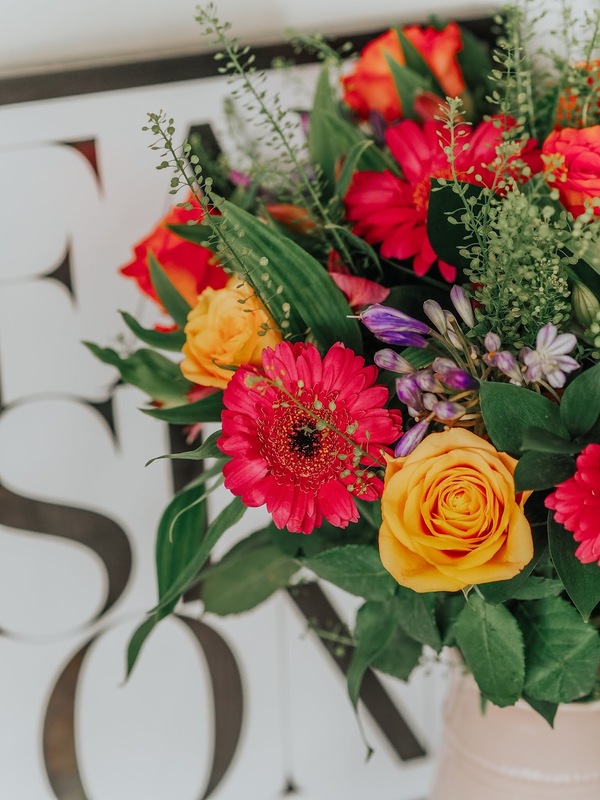 If you're looking to gift some fresh flowers, Appleyard London is a great site! Not only is the delivery super quick, but the flowers arrive in perfect condition. You can pretty much add a nice vase of flowers to any room of your house and they'll look great! I particularly love the look of them on the kitchen window, or in the centre of the dining table. Of course, if flowers aren't your thing, adding lots of potted plants will also do the job, adding lots of light and greenery to your living space! 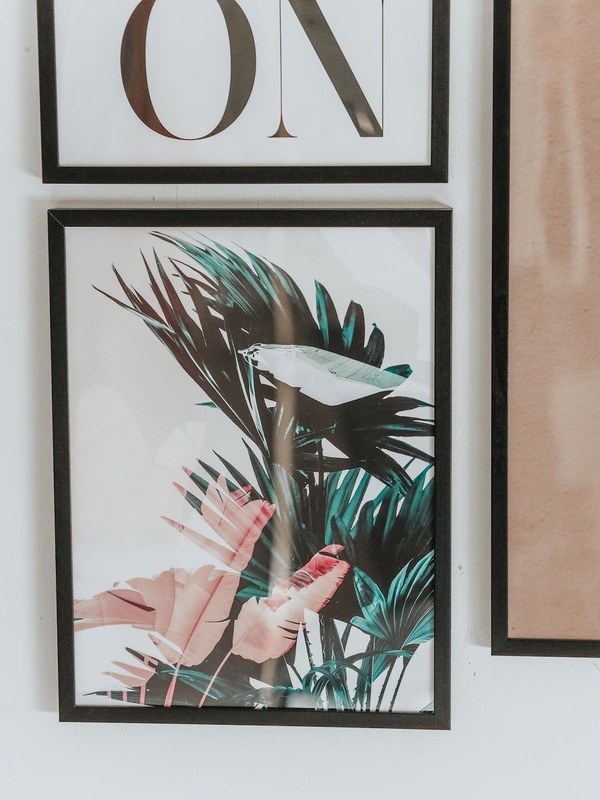 One thing I wish I did sooner was the addition of wall prints to my home! For my birthday I was gifted these beautiful prints fro Desenio, and they have totally transformed my bedroom! 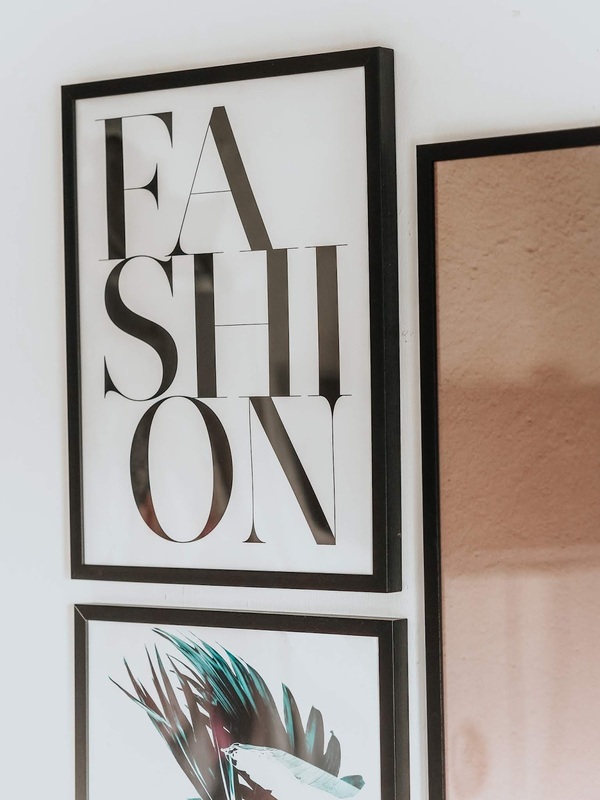 Picking out prints or posters allows you to give the room a whole new vibe with matching colours, or themes. Like I said previously, I prefer a more monochrome look with slight accents of colour, so opted for these three prints which just add a nice subtle pop of colour to the room. I also picked out the leaves print to go alongside my previous point of adding flowers and plants! Soft Furnishings are like a secret guilty pleasure of mine. Whenever I walk into a store and I see a super fluffy new throw, or a set of cute cushions, I immediately want them! Adding rugs, throws or decorative cushions to an area can add not only colours and patterns, but also texture! For example I love the contrast of adding a fluffy rug to wood flooring. What's great about these items, is that you can always change them up during the seasons! So in the Autumn/Winter, you can add more reds, oranges and yellows to make your home feel cosy and warm! Another thing you can definitely switch up during the seasons, are candles and diffusers. These days there are so many gorgeous candle designs, that are almost too pretty to use, resulting in them being used purely as decoration (guilty). Buuuuut, burning different scents during different months and times of year, will completely change the vibe and feel of a room. 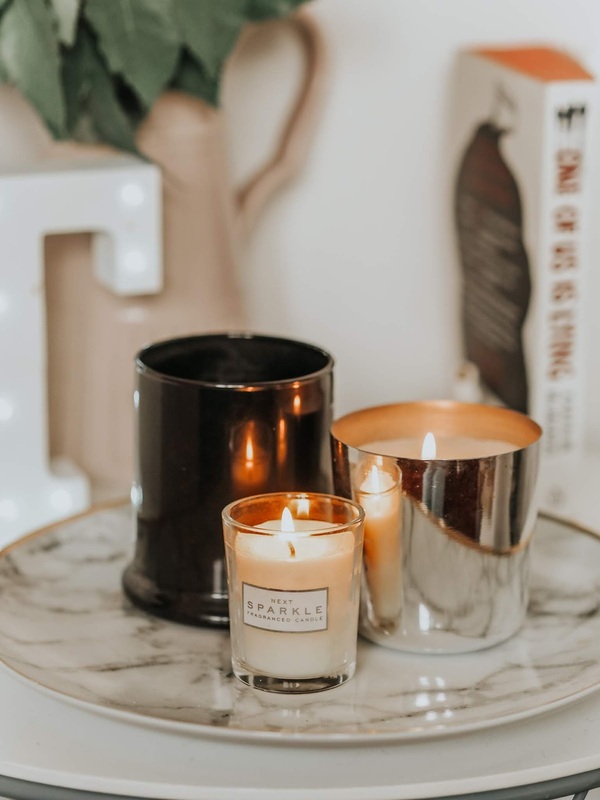 I'm currently storing away all my summer scents, and bringing back my winter scents such as cinnamon, pumpkin spice, red apple etc.. creating a more cosy atmosphere on those colder evenings! What's your favourite way to spruce up a room in your home? We have exactly the same thoughts! Flowers, candles and prints! With a few fur throws! This post is adorable. I love having all of those additions in my house, especially flowers. They are a great way to add a bit of colour as for cushions.. they're cute and comfy! Those flowers are beautiful, so so stunning! I love the wall art too, so pretty! flowers are my favourite thing to pop in the house, they brighten everything up so much! Candles and flowers are my favourites! Can’t go wrong if you’re looking for a present for me! I never have enough flowers but trying to start to implement them, love candles! I love having fresh flowers around the house as their so beautiful! I love these ideas and your prints are so nice!